Fingers crossed here — hopefully no one was unfortunate enough to be waiting at the shelter in the path of the driver, who reportedly decimated a concrete trash can on the sidewalk. SFMTA spokesperson Paul Rose said the cost of repairing Muni shelters doesn’t come out of the agency’s pocket — they’re repaired by Clear Channel, the contractor that uses them for advertisements. No word on if they pursue reimbursements from the driver’s insurance company in incidents like this. You don’t do that much damage going the speed limit. word — interested in details. did someone go to jail? hospital? I know you think you’re a good driver, but you can’t drive. Glad it wasn’t a ped or cyclist he ran down, THIS time. This shelter was on Sutter at Taylor. This driver must have been speeding in the Bus/Taxi lane. The car’s computer could tell the police whether the driver was speeding, but in usual fashion, SFPD will do nothing. Obviously rented, since nobody would actually buy a Chevy. Tourists? One important fact you all seem to have missed is the silver car behind the cop. Front right fender damage. The car that ran into the shelter could have been clipped from the back and spun. It’s hard/impossible to tell without additional details. What is probably going to happen is that the advertising company that is in-charge of it will repair it. 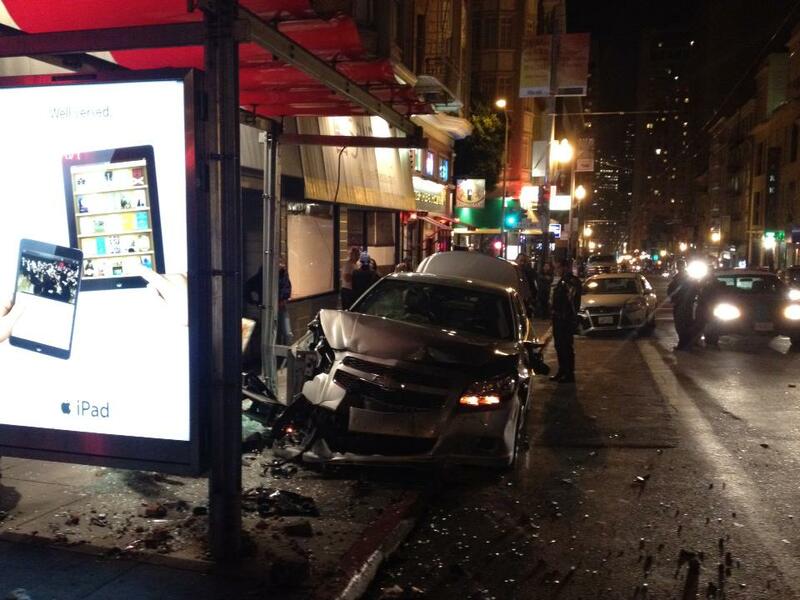 If not SFMTA will fix it, then sue them for the bill. Then downstream of that, the ad company will put the claim on the person’s insurance if they have any.. and that’s that. Yet another round of legal action that will take months to get through…. Good point. The driver might have been hit himself, and the shelter was just collateral damage. Or the driver might have swerved to avoid a cyclist or pedestrian. Let’s wait for the facts. A bit of auto-snobbery there. People actually do buy Chevys (and Fords and Dodges), especially when you get away from California. There is a world beyond Priuses (Prii?) and Volvos. Domestic sedans are not popular in this region. People that buy new Chevys or Fords tend to be crossovers, SUVs, sports cars, and pick ups. If it is new, domestic brand, and a sedan, there’s a good chance it is a rental (especially if the license plate doesn’t have a frame of a dealership). Domestic sedans are not popular in this region. What is your source for this claim? That’s a very easily obtainable figure from the automakers, can we assume you looked it up?